because Decorating shouldn't have to cost you a kidney or be too difficult to carry out. 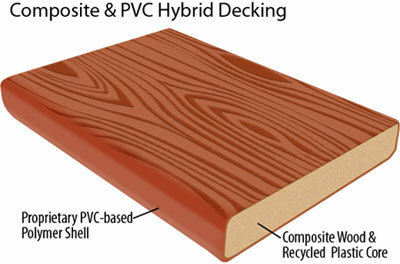 3 easy maintence products to consider for a build or remodel. Maintaining for home owners. 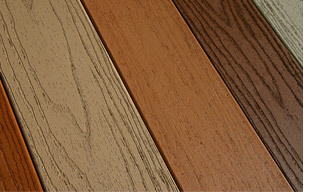 These may not be easy to install but you don't have to install it, the companies will do it for you. But once they are installed the products are easy to maintain. 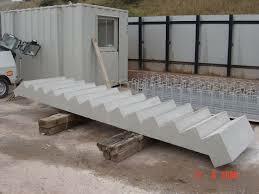 There are other companies in your area that can also do pre-cast concrete. Check them out they may have something that appeals to you and your sense of style. 2. 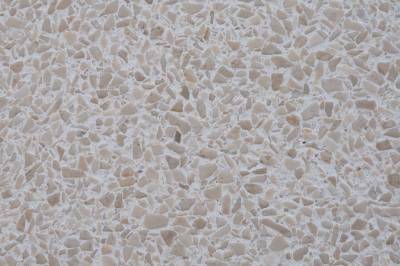 Another product you may want to look into during the home building or renovation process is Concrete Countertops, everyone knows about granite but concrete is something that is gaining in popularity because of of its durability, & it's practically impervious to heat, u don't need a trivet or potholder, which means a little clutter in the kitchen. The company out of Minneapolis I found was called Granicrete 507-383-7880 GranicreteMinnesota@gmail.com and GranicreteMinnesota.com I actually sat next to Jean E. From Granicrete while waiting for a special presentation on the lifestyle stage. She invited me stop by her booth and I didn't quite make it. Just to much to see at the home show. 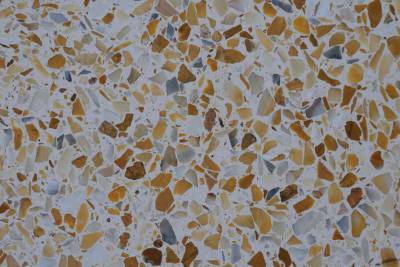 I am sure that you can find a company that specializes in concrete countertops in your area. I know what you're thinking concrete in my house, no way. 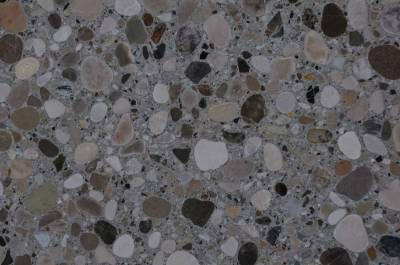 But like the pre cast concrete, it comes in a variety of finishes and can even look like granite. I don't know about other companies claims on resealing, but Granicrete claims Theirs won't need any resealing. And that makes it easy up-keep. 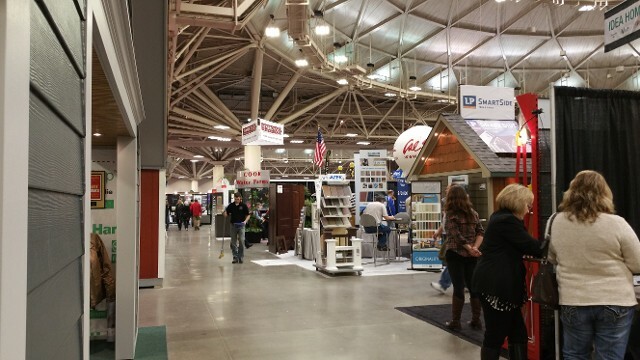 There are many great products at home shows, and many great demos to experience, as well. Again I must say check one out in your area, if you have a chance. Even if your not a homeowner, there are many great household products to check out too. All in all I had a great mini-vacation at the Home Show in Minneapolis. 1. Bathroom accessory Cups and soap dish- the bathroom cup can be re-purposed and used as pencil/pen holders and soap dish can be used as a paper clip holder. So the next time your in a home office store looking for accessories for your home/work office and can't find anything to suit. Head over to the dept store and check out the bathroom accessories, you may find something in color and design which can fit better in your office space. The best part about this idea is that you can get a matching waste basket and that matching soap dispenser can be used as a lotion dispenser to help keep your hands moist after shuffling those papers. 2. Office Wall Art- looking to bring in a little nature to your office so it doesn't seem so much like a work space, Try this easy project using twigs, you can hang your kids artwork on these outdoorsy art hangers and it just takes a few minutes to make them, using a hole puncher and yarn or Twine. Live near the beach or have a beach themed room, use driftwood. TIP: Does your computer keyboard need cleaning, and you don't have a can of computer cleaner handy. Well save your money, take a clean straw, blow while moving it on and around your keys. What is a can of computer cleaner but a can of compressed air. I know many of you have plenty of hot air in those lungs of yours, lol. 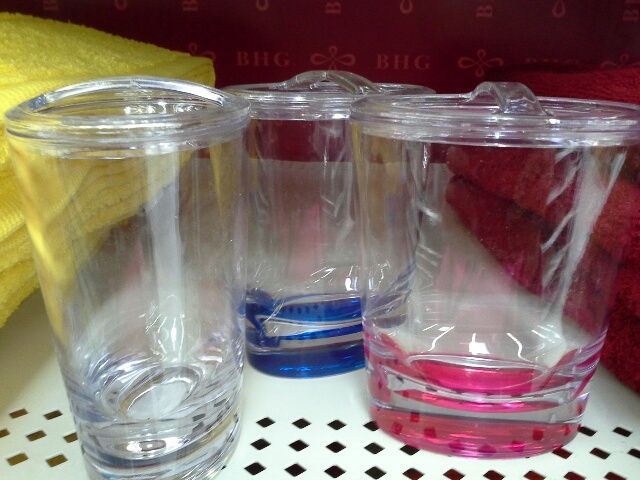 Save yourself some money, do you really need to buy air. Thought so. I have Asthma and I can still blow air through a straw, Ha! 5. 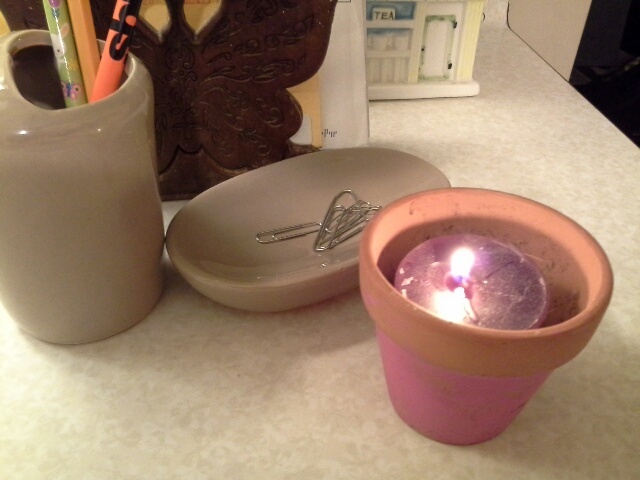 A Plant Pot - looking to bring a nice Smelling candle into your office, do it and use a flower/plant pot just place inside, and light it up. Planters come in many colors, designs and sizes, and if you can't find one in your to fit your decor, you can dress them up or even have your kids " design" one for you. One example is to wrap some Twine around them for a more rustic look or you can paint clay pots any color. You can also try stenciling. Or if your not feeling crafty, you can just leave it as is. 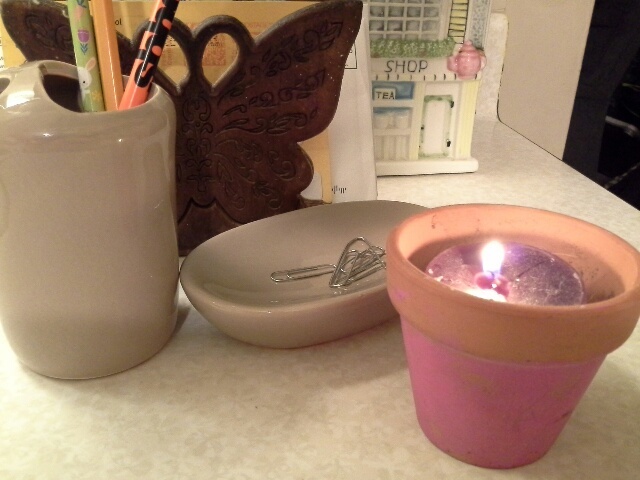 A little aromatherapy goes along way in helping you stay alert and energized to get that work done. As you can see accessorizing an Office doesn't have to be expensive, you can re-purpose many an object that you already own and turn it in to something new for your space. the best part is, it STILL has a purpose just not the one it was intended for! Accessories: 5 Easy, cheap common things u probably have in your house that can be used as accessories for Home decorating. Living on a budget and renting don't have to limit ideas when it comes to accessorizing your pad. here are 5 ideas that can save you time and money, and perk up your decor. 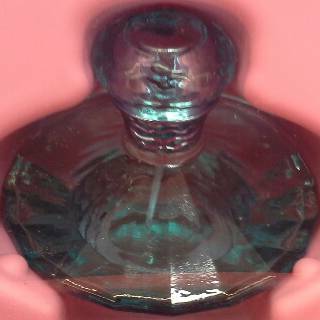 Imagine a small group display of perfume bottles. 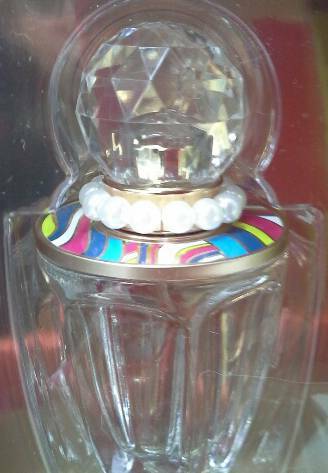 Perfume bottles have became downright fancy in the past few years and since almost every celebrity has a scent out, they have became very creative with the bottle and packaging to compete with other stars' scents. 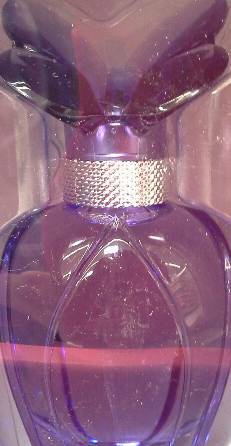 How many unwanted fragrances have you gotten at Christmas time, because you already have a favorite scent. Now you can put them to good use and not hurt anyone's feelings by actually "Using" it. I'm not talking plain beer bottles and cans here. But some of the finer whiskies and wines have some of the the most creative bottles. 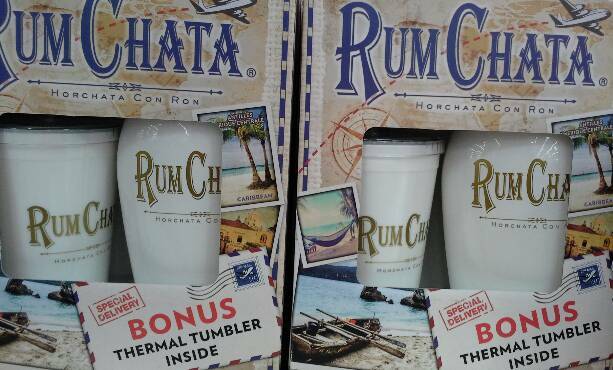 At Christmas time many of these come in even fancier bottles with matching glassesThese can definitely be arranged in a family room or Man-Cave for sure. If your concerned about having these things around the kids, either drink it, pour it down the sink or find a friend to drink for you. 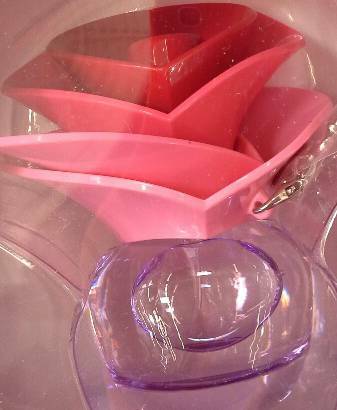 These bottles can even be used as vases for flowers too. I myself don't drink but I know plenty of people who can empty the bottle for me. Ha! 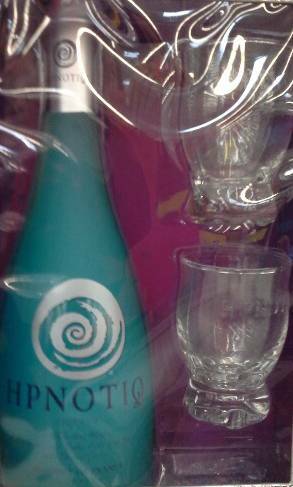 I really like this Hpnotiq bottle. The color is awesome and I think would look great in a beachy type room, or that Crown Royal bottle might look great in an office. Kids board games seem to be a thing of the past, with the onset of video games. However instead of throwing out old or new board games , consider using them as wall art. 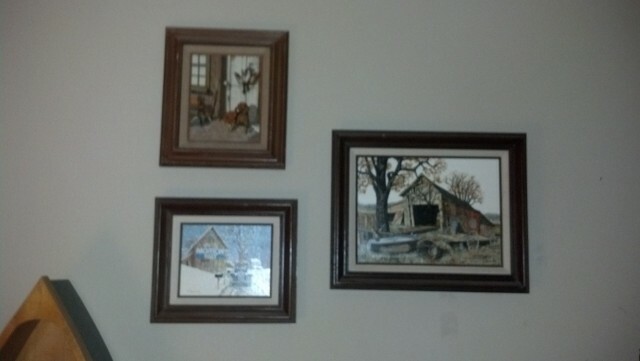 They can be affixed to the wall like any painting by running a little string or yarn through the back. 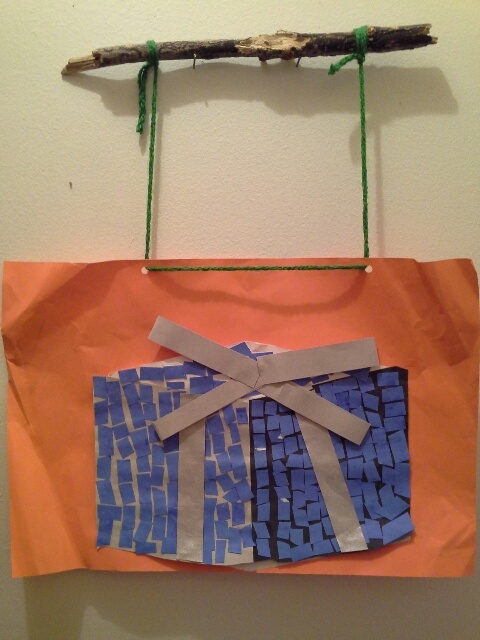 Then be sure to tape(less permanent) or glue ( permanent) the top and bottom together before hanging it up. If taping transparent tape works best. If you have a child that still likes to play them, buy two. I think this makes a great colorful whimsical solution for art in a young child's room.Here are some colorful examples. Some vintage board game boxes would look cool in a family room. 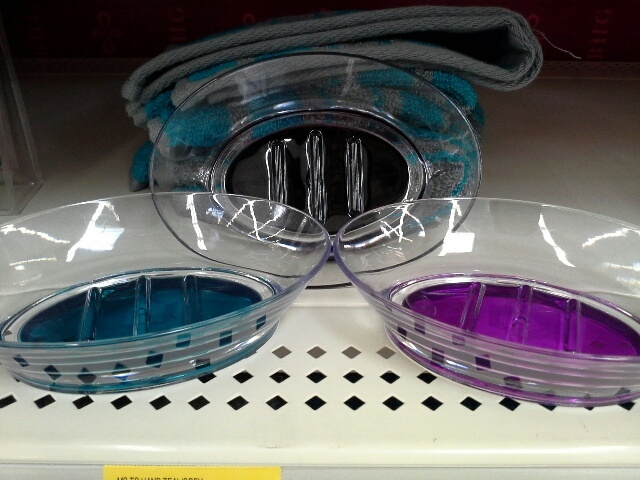 While the newer colorful ones would look great in a kids room or playroom. TIP: if you don't want to use nails you could always use double-sided tape to hang the board game boxes, and don't forget to empty the contents if your afraid it's too heavy to hang. 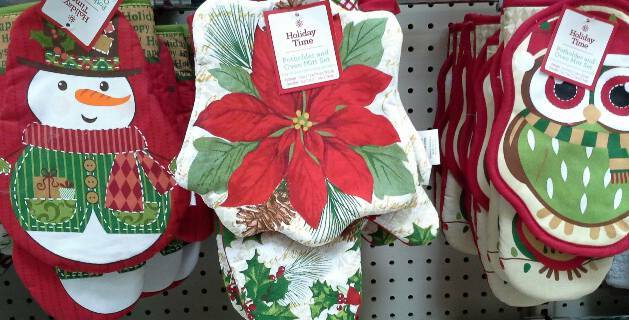 If your looking to bring a little of the Holidays into your kitchen but don't have the time for an expensive Re-do, look no further than those Christmas pot holders you got last year as Wall Art. 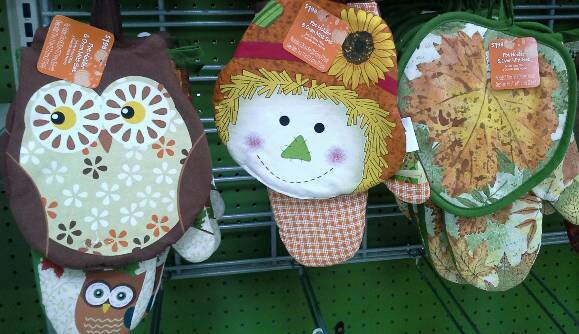 But don't just stop at Christmas, it seems there are new potholders and towels for every season and Holiday. You could even hang a wooden towel bar(Away from the sink ) in your kitchen and hang the holiday hand towels that you don't want to use and use them as wall art instead, and switch them out with the change of the seasons and Holidays. Check out these examples and imagine 3 or 4 of these arranged on a wall as art for a little holiday spruce up in the kitchen. 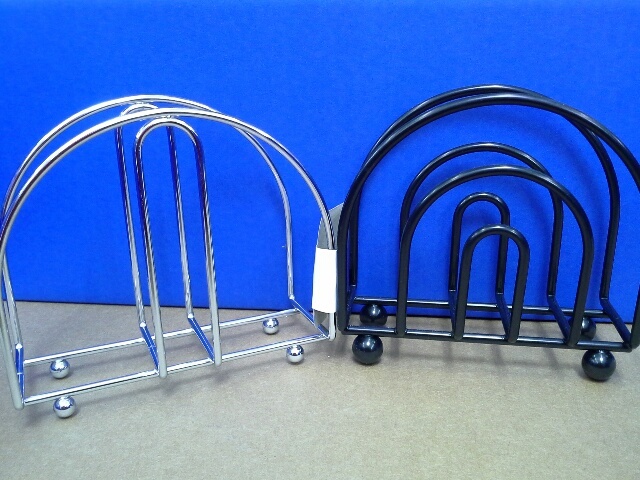 TIP: Small nails work best or you can use some hooks for the pot holders. Have a camera? Next time you make a favorite dish or dessert. Take a picture. 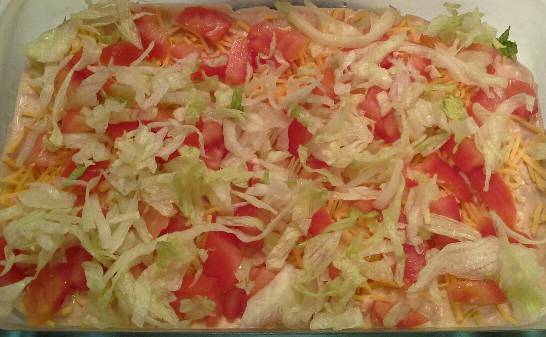 Your picture can be blown up into and 8x10 pr larger place in a frame and use for wall art in a Kitchen. Most people lack wall art in their kitchens and food pics is totally appropriate in my book. You can also crop your pics and other editing, on photo sites like pictureresizer.com for a more professional but low cost photo enhancing. 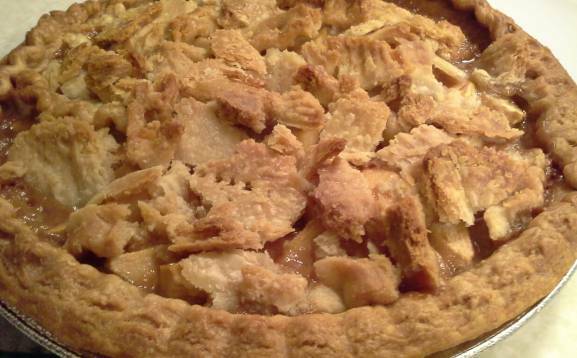 Love to bake,have an assortment of cookie, cake and pie photos. You can even use homemade bread, cut a slice and have it half falling over, (told ya, I know how to stage, Ha!) Have a multi-picture frame keep the pic size small and have an assortment of Photos in the same frame. Here are some samples of my food photos, that I would use for my kitchen. TIP: If your not very good at photography, you can find a lot of great photos online, just be careful of copyrighted photos. Finding accessories for a decorating doesn't have to be expensive or labor intensive. All it really takes is a little invention. 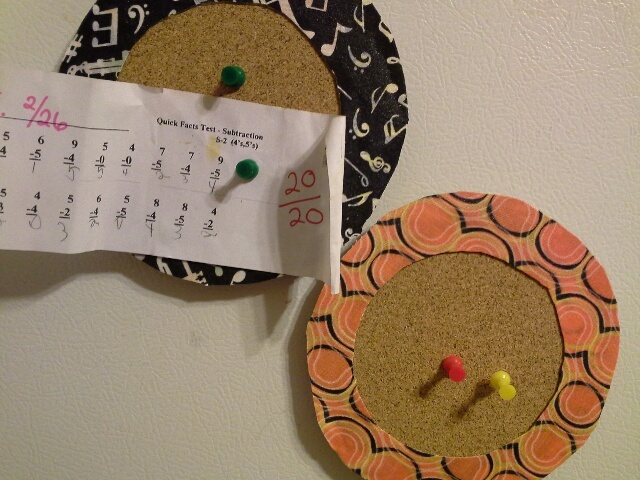 As a single mom who used to be a stay at home mom living on a budget, I learned to be inventive and frugal. Have fun with it and realize even an off the wall idea can yield a really great result. 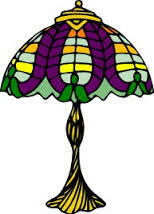 You don't have to be an artist to make accessories for your home, a little inventiveness and creativity goes along way. Hope this inspires you to look at objects in a new light. Recently on Ty Pennington’s website, typennington.com, I shared some Low Cost/ No Cost lighting options for those just looking to brighten and lighten it up with limited funds. Here is the blog post link where I offered some easy, less expensive tips to help with lighting issues. I guees Ty shouldn't Tweet asking people if they have any tips to share, Ha! Cause I literally took him up on it. HAHAHA! 1. I have been to a lot friends' houses over the years, and I have noticed many people place their lamps in a corner, which doesn't give off much light. So 1 low cost/ no cost way to improve lighting in your home is to move your lamps out of a corner, try moving it to the center of the wall if furniture placement allows it. 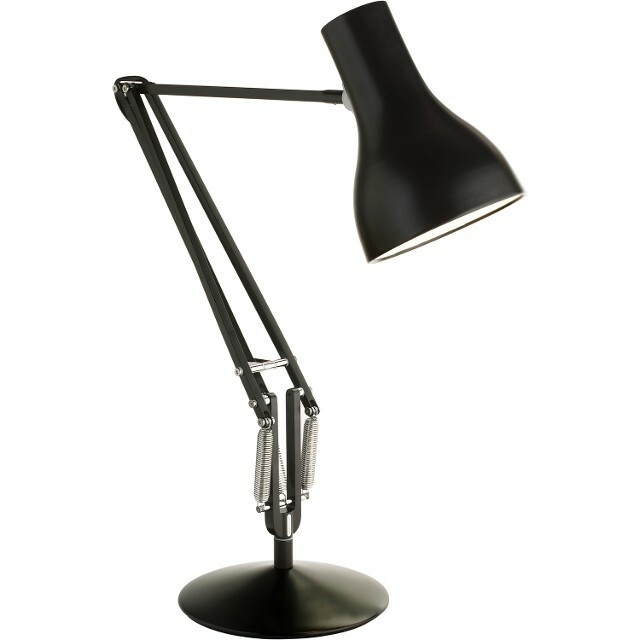 If the furniture doesn't allow consider an anglepoise lamp so you can direct the light to the center of the room or wherever you want. 2. Almost everyone buys soft yellow light-bulbs, a low cost way to improve lighting in your home is to simply change your bulbs out, GE makes their Reveal line of bulbs that improve color vibrancy, and now they even make LED & CF's versions, which help energy efficiency, last longer and save you money in the long run. And if Reveal is too true for you try a clear bulb. 3. 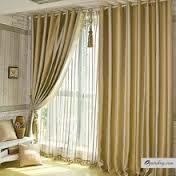 Lastly, let some light in, open the curtains, remove the curtains, and/or buy new more sheer curtains. A little note on Curtains, Curtains get a little dingy hanging there day after day. When is the last time, you laundered them, This will help lighten the room considerably by just washing the draperies. Not to mention this will help with your allergies, I know I have allergies and asthma. I don’t like blinds, they are so boring and severe, to me. I prefer the softer look of draperies but they do need washing every so often. As a single mom I must say I really don't have a lot money to decorate and when School is in session I really don't have the time either. but sometimes I do need to do something with my space. The first most important Tip I can give you about low-cost decorating is this: Re-arrange. Re-arranging costs absolute nothing. and you can experiment with different arrangements. Don't be afraid of change. 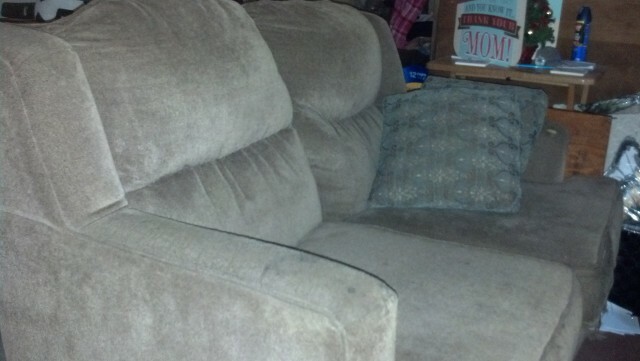 Try moving that Sofa from against the wall and a putting it at a new angle. Bring in something from another room in the house, My mom is an interior designer and was a single mom as well, she re-aranged the furniture about once a month, me I am more like every six months. This was her way of redocrating without spending a dime . More real tips will follow , and I hope I can get some semi-celebrities to contribute articles as wwell. Also I plan on redoing my apartment this summer and willl be blogging about it from start to finish with Before and after picks. Then you can see redecorating on a budget first-hand. So stay tuned. The second Tip I want to offer about Decorating on a budget is: Change your wall Art to different positions around the room. Wall Art can be changed around , put in a different location and used in different, these Butterflies for instance can frame a doorway or closet. 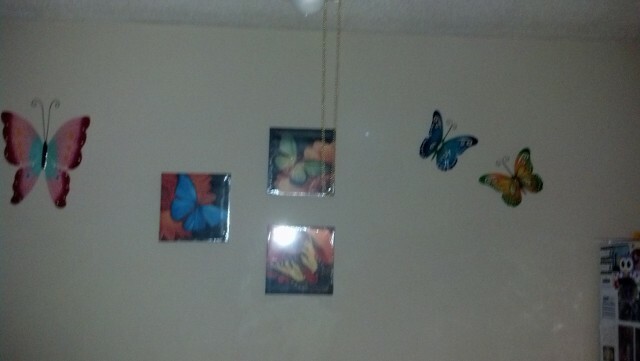 You can put the square paintings all in a line and put the butterflies above, below or both. There is no wrong or right way, If it looks good, go with it. 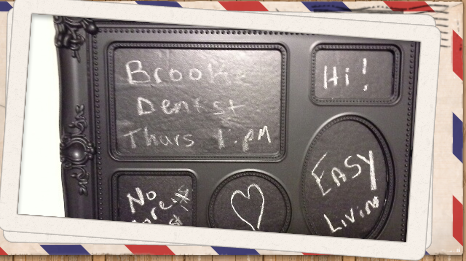 Embrace change and move pictures and/or other wall pieces it's simple and easy and No-cost. This is truly effective when doing this after Re-arranging the furniture. So, don't forget to Re-arrange your Art pieces after you have done the furniture for a more co-hesive look. Mom always re-arranged art too after doing the furniture.